Another great review Dan…always enjoy your review site and participation in the Gear Geeks podcast. 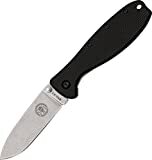 I’m not usually interested in value/budget folders but having used a Rat 2 as my “yard work” knife for the last 18 mos, I’ve been so impressed with it that I may have to buy a Zancudo as well. It’s my understanding that Blue Ridge in Taiwan manufactures both the Rat series for Ontario and the Zancudo for ESEE. Thank you, K. Yes, these value folders have their place and the quality on some of them, like the Rat II and Zancudo, are quite good. I have heard that the Zancudo and Rat II were manufactured in the same facility as well (not surprising given the relationship between Ontario and ESEE), and when you examine the knives closely there are definite similarities in the build qualities and materials that would suggest they are made in the same place. Dan, I read this review last night, and it was the first knife review I’d read in a while. I tend to get really focused on an interest for a while and then move on to something new, and a few years back I was really into EDC knives and read this website religiously. Since then I haven’t been paying too much attention to knives as I got more into firearms and other stuff, but I got the hankering for a new EDC knife recently so I popped over here. This morning I bought a Zancudo, and since then I’ve been reading other reviews on it. Some of them are less positive, with many pointing out that it’s only licensing the ESEE name and so on, but I bought it based on your review so I’m perfectly confident. You’ve never led me astray and you never hesitate to call a spade a spade. This will be my first framelock, I’m excited. Thanks for all the work you do around here man, I made sure to get it through your link. Thanks for taking the time out to leave a comment, and thanks for coming back to check out the site. For $30, the Zancudo is a very nice knife. True, it’s not made in the USA like ESEE’s other products (and I tried to make that clear in my write up), but I can’t argue with the end result. It’s not a perfect knife, no knife for $30 is (and I’ll argue that I can find something to dislike with any knife, regardless of the price), but I think you will find that the Zancudo is thoughtfully designed with the end user in mind, and well made. Do let me know what you think of it after it arrives and you have a chance to form an opinion. Thanks again for your support of the site. Hey Dan, since you asked me to let you know what I thought of the knife I decided to give it a few weeks of riding in my pocket and get back to you. I love this knife. The second it fell out of the plastic and into my hand it just felt right. The plastic isn’t G-10 but it feels better to the touch than some G-10 scales I’ve handled. The framelock is great and makes for the most satisfying deployment noise of any knife I’ve ever handled. And while some would say that the noise it makes isn’t a big deal, I don’t think any knife guy doesn’t care about those sort of details. Fit and finish on this cannot be touched by anything in the same price range that I know of except maybe the RAT 1, and to be honest my RAT’s blade isn’t centered as well as my Zancudo’s. It came out of the box sharp, sharper even than the Cold Steel knives I’ve owned. Again the comparison to the RAT comes to mind, as it was a lightsaber out of the box as well. Basically, while I haven’t gotten my hands on a RAT II yet, I can’t see how it could be any better than a Zancudo- unless of course you’re a lefty. For a righty, I think the Zancudo compares favorably with the RAT 1 in every aspect of build quality and utility, comes in just as many cool colors, and has a stronger lock. I don’t own a Sebenza or anything, but I have had a few knives north of 100 bucks that weren’t better than the Zancudo. The first day I carried it I tried to cut a plastic band holding a pallet of stuff together that turned out to be a metal band, and destroyed the edge. If I’d done that with a Spyderco Sage, I would still be crying. But the beauty of AUS-8 is you can bring a rolled edge back to factory sharpness in about 5 minutes, making it one of the best choices for a working knife in my opinion. And honestly, when I heard the screech of metal on metal my first thought wasn’t “oh no, my new knife,” it was “SWEET I GET TO BUY ANOTHER ONE.” Which I did, despite being able to fix the edge, because this really might be my special favorite knife and it’s cheaper than what I use to sharpen it. The RAT I will probably go back to its place as my serious work knife, just because a bigger blade offers no downsides where I work and has a few advantages (though my Voyager XL, I’ve learned, is big enough to cause a commotion anywhere). But while for many the RAT II seems to be an answer to a prayer for a smaller RAT, I’m over here praying for a bigger Zancudo. This is a hall of famer for me, and will be my go to recommendation for knife newbies. I don’t know why I love it quite so much, but I think we all have one or several knives in our collection that just resonate with us and this is it for me. Plus, you didn’t mention this specifically in your review so I really hope I get to point it out to you: the mosquito on the blade is also a drawing of the knife itself half open. Anyway. Point is, I like it. Actually Kyle, your prayer for a larger Zancudo is coming soon…the ESEE Avispa Folder (Avispa: Spanish word for Wasp) 4″ Frame Lock is due in at knifeworks in April or May. Interesting! I’ll be buying one. Wow, nice, Kyle. Glad you like yours too! Bought one of these a couple of months ago on your recommendation. I couldn’t be happier with it. Very comfortable to wear and use and well made. I would certainly recommend this to anyone looking for an edc. Thank you, Foster. Glad to hear my recommendation was on point! I like this one so much I actually just recorded a video on it (which will be up soon). Thanks and enjoy your Zancudo! Dan, couldn’t agree more. I have a couple of these and a couple of it’s big brother blades. These are excellent values. I paid $26.99 for my most recent 3″ Zancudo. For that I get a nice drop point stonewashed blade. I think stonewashed blades are the way to go. No finish to rub off and no polishing. This knife just flicks out with minimal thumb thrust and locks up solid and when closed is dead centered. I have more than several Rat 1’s and 2 Rat 2’s. If given a choice I’d choose the Zancudo’s over the Rat knives. Thinner, nice solid frame lock, they seem a tad more robust to me. Take a very nice edge easily due to AUS-8 which is one of my favorite steels. They also have a better grip over the Rat’s somewhat slicker scales. Just winner blades. The fact that they’re made in a Democracy (Taiwan) is not to be omitted either. I’ve gone out of my way lately to avoid Chinese made knives. To often I see people equate Taiwan with “Chinese made” when it’s simply not true. BTW, you’re my favorite reviewer by far. If you like a $25 knife you say so whereas some tend to be a bit snobbish about that. Thanks for stopping by. I am glad to hear you have been enjoying your Zancudos. I know I still like mine, and have been meaning to check out the Avispa. I see your point in terms of the Rat 1, and I agree with you. I like the thinner profile of the Zancudo as well. I know that many guys who collect knives see it as a progression, eg, moving “up” to more and more expensive knives. I have found that I am checking out pricier blades as well, but I still get excited about a quality tool at any price point, and many of the knives that actually stay in my collection are under $100 and get regular use. Thanks again for the comment and kind words, Greg. Much appreciated! I’ve been using a Zancudo for the better part of a year & it has now become my EDC. It is light enough & compact enough to comfortably carry all day. It is unobtrusive & it’s pocket clip is not only streamlined, but strong. I am a big fan of AUS 8 steel for a knife at this price point. I personally think that once again ESEE has a winner. Your review above was spot on in my opinion, & I am looking forward to seeing your future reviews on otherESEE knives. Thanks and keep up the good work. By the way, I’m in law enforcement & take my knives very seriously. Thank you very much for sharing your experiences with the Zancudo. It remains one of my all time favorite blades at this price point for the very reasons you described. Thanks for reading and I am planning on checking out some of ESEE’s new Camp Lore series at some point. I just got back from picking one of these up at my local knife & tool. A few weeks ago I was there picking out a newbie knife for a friend’s fatherless son. He had never whittled before nor even operated a locking knife so I had to show him how to process a marshmallow stick. At any rate, the Zancudo’s blade shape and finish caught my eye. I asked to hold it. Opening it and feeling it in my hand, I asked the sales guy why I don’t already have one. Well, the answer was I have a lot of knives already. I haven’t had a chance to give this kid the knife I got for him and since the feel and design of the thing has haunted me ever since, I decided I’d better get another before I opted to keep the 1st. I’m now holding my new EDC beater knife, and the kid still gets his 1st knife and fenix flashlight. Totally satisfied… but now I predict I have some ‘splaining to do w/ the missus. Congrats on the Zancudo. It is a sweet little knife and I appreciate the story. Good luck explaining this one to the Ms.! I just purchased a Zancudo. It is a great knife for a small amount of money. I also purchased the Avispa which is also a good knife. It is very similar to the RAT 1. Perhaps the Avispa is a bit more robust than the rat. I have found a least one thing I don’t care for but will wait until you review the Avispa to see if we both agree. Both the Zancudo and Avispa have found places in my under $50 knife collection. Thanks for the comment – I still need to order an Avispa. I still really enjoy the Zancudo, so I need to take a closer look at the Avispa. Glad to hear it has earned a spot in your collection. I love this knife. I used as my go to knife to cut my insulation and do everything to rebuild my house. Then I lost it for half a year after I was done. But I found it yesterday behind my washing machine! Man I love it. I live in belgium so it doesn’t cost 30 “bucks” here. However I adore esee knives, an though I know it really isn’t a true american made esee knife, i adore aswell. The AUS8 sharps so well and it’s cheap so you can really…really use it. Perfectly balanced, perfact blade shape. Just a great little blade! Thanks for your thoughts on the Zancudo. I love this knife as well – probably my favorite in the $30 range. I hope yours didn’t cost you an arm and a leg in Belgium, and it’s always a nice surprise to find a knife that you have misplaced. I have been looking for my Dragonfly 2 for a few months now… maybe I need to check behind the washing machine! Why has ESEE dropped their Kydex sheaths on the 4 and others? Honestly I have no idea (and this is the first I am hearing about this). If I get a chance I’ll dig into it further, and maybe someone else will chime in with some thoughts. I’m enjoying my new Zancudo very much after a short break-in period. I understand that it’s now available with D2 and G 10 upgrades….What do you think? I heard about the D2 version. Did not realize it included G10 – that sounds great! I will have to pick one up. My guess is that these will be nice upgrades.